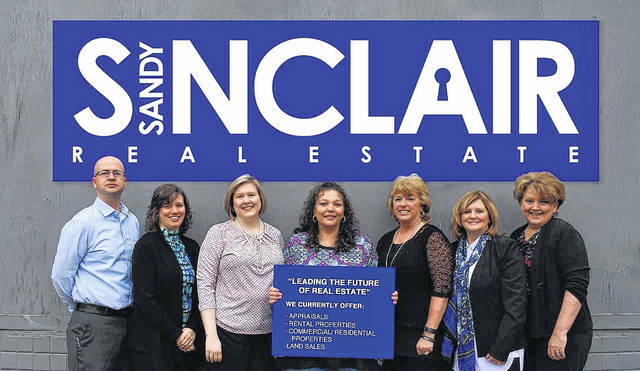 Long-standing real estate company Sandy Sinclair Real Estate has expanded its sales team. SSRE opened in the early 1990s, making it one of the oldest real estate brokerages in the county. Owned by Sandy Sinclair Wilburn and her son, Jon Sinclair, SSRE has made changes in their services over the years, with most recently their primary focus being on the appraisal business. Recently, Jon Sinclair became interested in obtaining his broker’s license and expanding SSRE’s real estate sales team. This thought came to life, and in February, SSRE welcomed four experienced agents and a sales manager. Donna Rayburn has been a real estate agent for more than 30 years, and has worked in both the local market as well as the Columbus market. She comes to SSRE as a seasoned real estate agent who is well-attuned to the ever-changing real estate business. In addition to working in real estate, Rayburn is also a promoter for Portsmouth Raceway Park. Because of her experience as a promoter, Rayburn has a lot of marketing ideas from which both SSRE and her sellers can benefit. Last year, she was awarded the Top Producer recognition by her previous real estate firm. To reach Rayburn, call 740-821-1161 or email rayburn31@aol.com. Kathy Leesburg is an agent who has been selling real estate since 1995. She specializes in residential, commercial and vacant land sales. In recent years, Leesburg has been recognized as a million-dollar sales producer. She absolutely loves the real estate business because of the opportunity it gives her to meet new people. You can reach her at 740-821-2335 or via email at kathylessburg@yahoo.com. Molly O’Bannion has been a real estate agent for 17 years, and specializes in residential and commercial sales and leases. She is also a relocation specialist. O’Bannion has consistently been a leader in sales, with awards being received for Superior Sales and Outstanding Sales. She attributes her success to the strong relationships she has formed with her clients, which has generated repeat and referral business for her. Contact O’Bannion at 740-935-3522 or aljomr@frontier.com. Terrie Zempter began her real estate career six years ago. She previously was a small business owner, which instilled in her hard work and dedication. She shows this same dedication to all of her clients. Despite not having as many years experience as the rest of the agents, she has certainly still been very successful and is a multi-million-dollar producer which has earned her the Top Producer award at her previous firm. Contact Zempter at 740-981-7390 or tzempter@yahoo.com. The agents of SSRE look forward to an exciting year with their new company. With their marketing plan, enthusiasm and exceptional service, they plan to continue to be just as successful as they have been in the past. Those ready to buy or sell a home, commercial location or vacant land are encouraged to call 740-354-1151 or visit SSRE’s new website at www.sinclairRE.net.